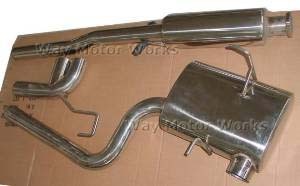 Ireland Engineering Mini Cooper S Stainless Steel Cat Back Exhaust for 2002-2006 R53. This system is completely polished 304 stainless steel. From the cat back it has a 2.5" diameter pipe with a center muffler/resonator and a single rear muffler. Twin tips are 2.75" diameter. Tip position is adjustable so you can be sure it will fit the factory opening. Ireland designed this system with a single rear muffler because they felt a 1600cc engine does not need 2 rear mufflers, especially since they are using 2.5" tubing. The Dinan exhaust was the same way. This design works, and saves a lot of weight, is easy to install and maintain. Sound level is louder than factory system and with deeper tone. Installation is easy as our system uses the factory hangers and bolts directly to the factory Cat. We are now including some clamps for the hangers to help position the muffler under the car. Please specify hanger style to get the right exhaust. The IE cat back exhaust required a little modification to fit. A big draw back of this system it that it drones from 2800+ rpm. I had to install glasspack to get the drone down to stock MINI sound. On the plus side it sounds great at idle and my mileage went up .5mpg. Just received my Ireland Engineering R53 Cat Back. Packaging was great. Installation was easy. Every hook lined up perfect with every existing hanger. The sound is just what I was after, a little deeper than stock, without sounding like a 17 year old kids car. Very happy with purchase.